We all know the name. We all know the man. We also know what he has been able to achieve. We have read about his aspirations, and his vision. But, do we know how he has achieved it? Today only, get this Amazon book for a limited discount. Regularly priced at $4.99. Read on your PC, Mac, smart phone, tablet or Kindle device. Do we really know the man who wants to make America Great Again? Donald Trump is without a doubt one of the most successful investor’s and entrepreneurs of our time. What he has been able to achieve seems almost surreal. Some would say he has been lucky, and just happened to be at the right place at the right time. There are some people that would say Donald Trump has a deep knowledge of psychology and used that to achieve his success. Those people would be right. He lives by strong principles, and a drive that has made him into the man he is today. His determined character has been a pivotal key in shaping his destiny. Many believe that he can win the election. Will he win? Nobody knows. Can he win? Yes, he can. This book is about discovering how he achieved his success. 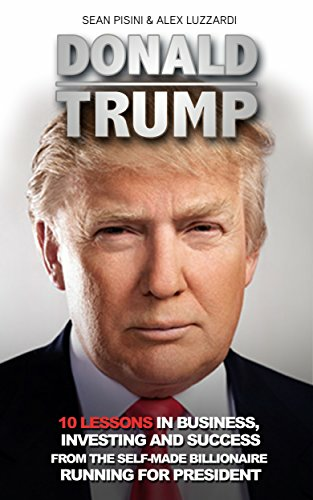 The purpose of the book is to explain 10 lessons; 10 principles that Donald Trump lives by. This will not only help you to understand the principles Donald Trump lives by, but to also help you put these lessons into your own life, business and career. This book will provide you with an insight in his personal life, explaining how events have shaped his life, and detail the lessons and principles he lives by. Who is Donald Trump? His story. What makes him a good investor and solid businessman? What are the lessons he lives by, and why? What events showcase he actually lives by those principles and ideas? What is his message?, His cause? His purpose in life? It could even help you to decide if you will vote for him in the future..
And this is just a preview.. Learn from the man who wants to “ #MakeAmericaGreatAgain,“ whether you agree or not. Some lessons are easily taught by other people, but it does not have the same effect if you learn them from Donald Trump, the self-made billionaire running for President. Enjoy the book. Learn from him.